Embracing change is an integral part of any business model. Outdated processes and procedures are invariably supplanted by “cutting edge” technologies and newer, more challenging paradigms. 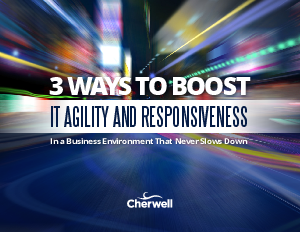 IT departments are facing the most formidable challenge of their business lifetimes, and their very survival rests in the balance. As business continues to become “lean and mean,” IT is challenged to move even faster to keep pace with the varied support needs of its internal customers. used to determine the effectiveness and profitability of any given process or department. At the same time, IT is expected to do more with less, supporting more users, more devices, and a more diverse set of services—without a corresponding increase in allocated resources to balance the ever-growing demand. The strain is evident. Something has to give and, unfortunately, it will.